This past weekend marked the final climb of the season for Stephanie and I. We had originally planned to do a guided day-hike with the Adirondack Mountain Club (ADK) but at the last minute, we received an email stating that we would only do 2 (Donaldson and Emmons) of the 3 summits in the range. Normally we’d roll with the punches, but this was a bit of a big deal. You see, Steph was at 20 summits, having decided not to push through and summit Rocky during August. We really had our hearts set on being halfway through the 46 High Peaks at the end of this season. So we dropped out of the guided hike, and decided to do it on our own. We drove down on the Friday night, had supper in Tupper Lake (Pine Grove Restaurant on Route 3 is lovely. I recommend it if you’re in the area) and then parked at the trailhead on Coreys Road. We were all set to car camp – fairly easy when you have an SUV with back seats that flatten down. We got cozy, had a plastic cup of wine, then rolled ourselves up in our sleeping bags and went to sleep. We were up early the next day, and were on our way by 6:45. There are two trails that lead from the trailhead, and we took the one straight on from the register (in fact, we never saw the other path) In hindsight – this may have been a horse path, as the first 1.2/1.4 miles (there’s some dissension here – the book says 1.2, the signs say 1.4) was incredibly muddy, but fairly flat. I had to do a quick sock change early on, as I got a soaker, but otherwise it was uneventful. Turn right. Follow the horse! – Yes, avoid the horse trail, BUT the sign that points to the right, with the horse head on it? Follow that. Turn right, and follow the tote road 3 miles to the Calkins Creek Trail, which will be on your left. So we turned left, figuring we wanted to avoid the other horse trail, that roughly parallels the Ward Brook Trail. We should have turned right, which would have taken us to the Calkins Brook Trail. So I’m going to describe the Ward Brook trail, just so you don’t accidentally take it. Trust me, you don’t want to. It was quite easy, very rolling with gentle ups and downs. There were about 5 or 6 brooks to cross -all stone hopping. One had a bridge at one point, but it is now down to one log. It was much easier to stone hop over than attempt the log. 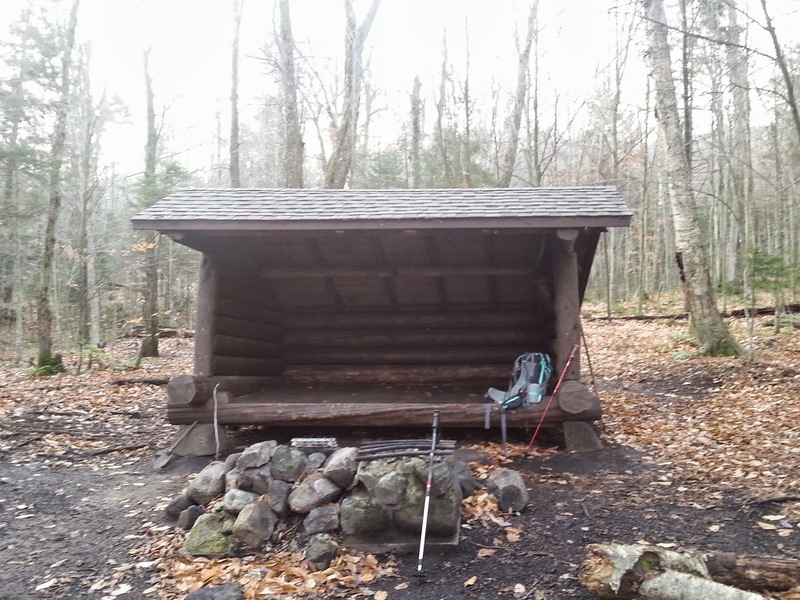 At 9:30, we reached Blueberry Lean-To – it was empty, but well-kept. (If you’re planning on staying, there’s a rake, a shovel, a broom, a frying pan, someone even left a pen and some crossword puzzles!) We took a break, used the outhouse (didn’t smell great, but what outhouse does?) and kept going. We went over two bridges; almost immediately after the second one we found the cairn marking the route to Seward Mountain. 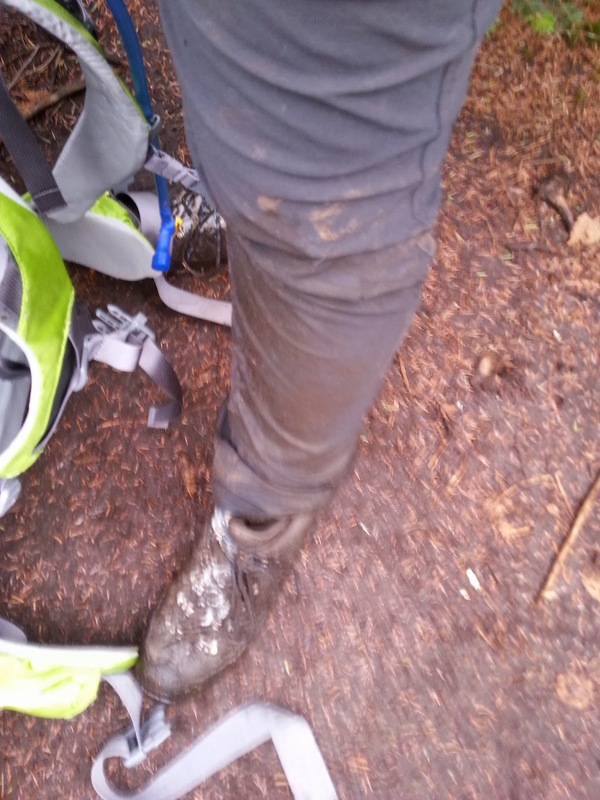 The route up Seward was rough, wet, and muddy. We followed the stream for a little ways over rolling terrain – it wasn’t terribly difficult, but it was serpentine and rose and fell as it went along. About a half hour after we turned off the tote road, the trail began to climb in earnest. At any rate, it was wet and slippery, and we got angry and yelled at the mountain, and vowed to never, ever again hike this trail. We climbed for what felt like hours. 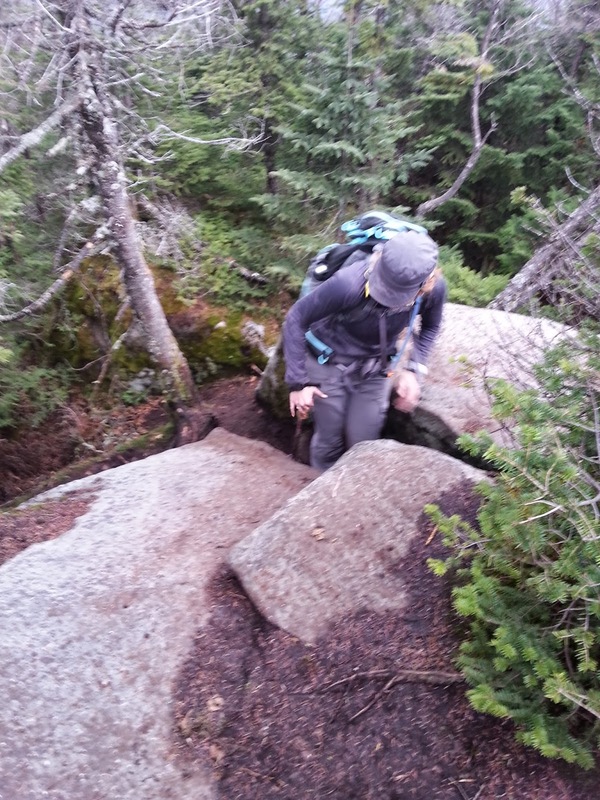 (In fact, it was – we started the trail around 10:00, and didn’t summit until 1:15) We hiked ourselves up tree trunks and roots, shimmied ourselves up massive ledges, and if you want some bouldering practise, there’s that too. We finally got to the end of the grind, and gained the summit ridge. We were so busy celebrating and chatting, that we kept walking until the trail started to descend. We figured we had missed the summit marker, and doubled back to find it. (Thus starting a 10 minute fruitless search.) 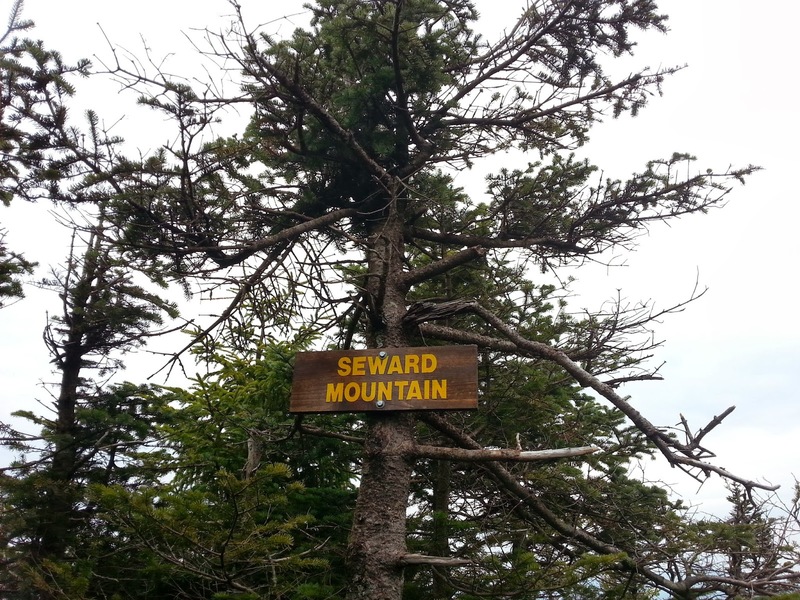 We finally gave up, figuring we must have missed it, but confident that we had indeed summited Seward. Turns out the summit was past this point – the trail descended slightly, before ascending again to the true summit of Seward – marked not only with a small yellow disk, but also a brown sign with “Seward Mountain” on it in yellow. Have no fears – you will not miss this summit. It’s on the trail, not off to the side like Donaldson, or Emmons. You cannot miss this sign. We took our pictures, and started out again towards Donaldson. The trail was steep and rocky, but a breeze to scooch down. We met two groups heading up to Seward, including one who was finishing their 46. We descended to the col, then started up again towards Donaldson, (not as steep this time, but just as rocky) passing the cairn marking the path to Calkins Creek Trail. Just past this cairn, after about a 15 to 20 minute walk, we hit the summit of Donaldson, just off to the left of the trail, where a large group (possibly the ADK led group) was taking a breather. We quickly snapped our photos and ran on, as it was 2:20 already. There was no way we were turning back. We decided our problem had been that we were rushing, and not going our pace, so if we scaled it back….we’d get there in one piece. Bruised, battered and bleeding, but we’d get there. We ran into another two-person team, threatened them with bodily harm if they didn’t tell us how far to the summit, and kept going. We rounded a corner and there before us was Emmons…….and man did it look far away. But, we told ourselves, it’s the Nippletop syndrome – what looks to be miles away, is in reality incredibly close. We pressed on, but with one caveat – that no matter what, at 4:00 we would turn around. If that meant not summitting Emmons, so be it. We walked and walked, wondering how much further, how much further, how much further. The trail started to twist around, almost going in circles it felt like, and I could feel that the summit was near. Indeed, around one last corner, and up a small rocky incline was the summit of Emmons. We did our now-traditional shot of whiskey (missed on both Seward and Donaldson in our rush) and sat down for some food. At this point, we had only taken two or three quick breaks for food. 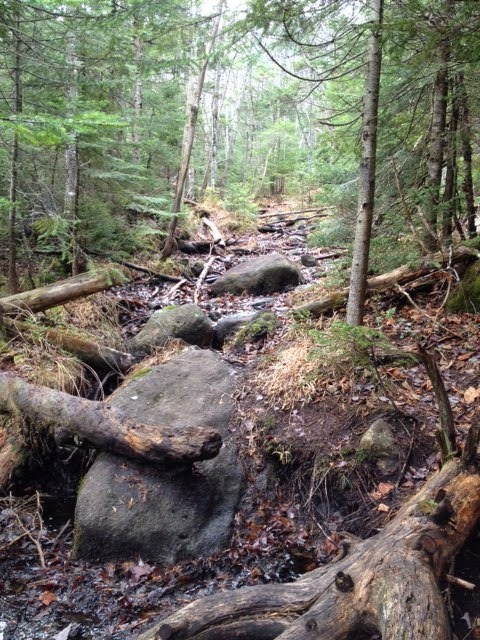 At 3:40, we were up and back on the trail, tracing our path back to the cairn for Calkins Creek. We got back to the cairn around 4:45, and took a quick break to change socks and pants (taking off our muddied and soaked hiking pants to put on rain gear over our thermal long johns). We were back to hiking at 4:55. Calkins Creek trail is beautiful. It’s a very gentle grade (at least going down – we didn’t find our toes jammed into the toe of our boots) and very spongy, great after hiking on rock. It is a little monotonous – there’s really nothing to say other than – it keeps going down/up, is very nice to walk on and is very easy to follow. We crossed two streams before having to pull out of headlamps around 6:30. Thankfully (the only time I will say this) the trail was fairly muddy, so it was easy to follow in the dark. We did have a spot of panic when we came to a river crossing, with high water and few good places to ford. This is right before the end/start of the herdpath (although we didn’t know that at the time). We calmed ourselves, looked for the cairns (there are cairns on both sides) and then rock hopped over the river. (We were less concerned at this point about getting our feet wet). We quickly afterwards came to the old lumber/tote road that leads back to the trail to the parking lot. This calmed a lot of our fears, as it’s easy to follow a road (no matter how old or disused) than a herdpath through the forest. But of course, this is the point that it started to rain. 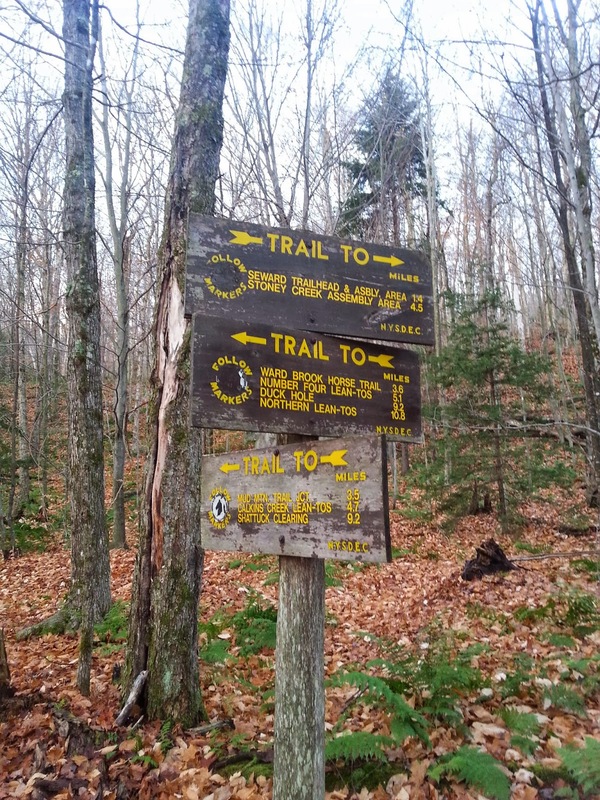 From the register: there are two trails – follow whichever, but the one straight on is rough. – Upon junction, TURN RIGHT. 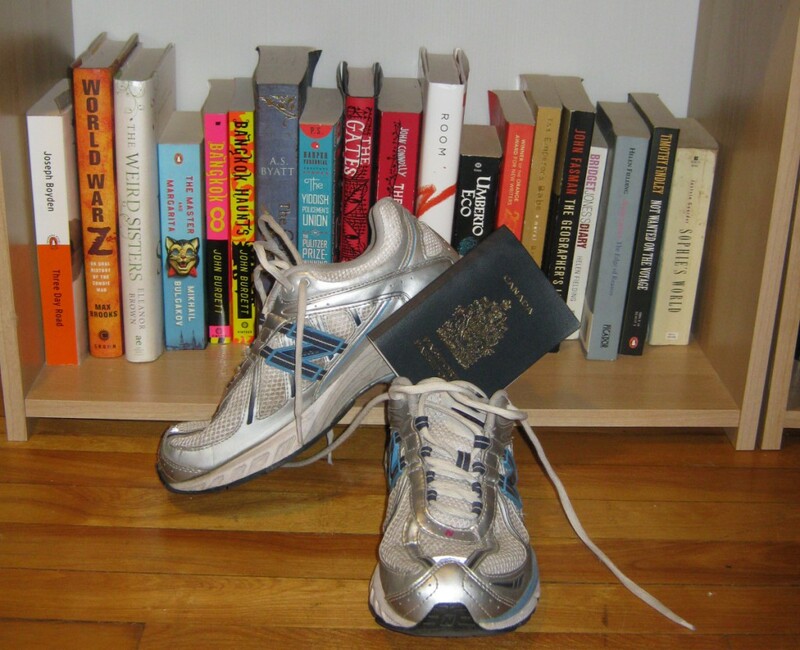 You will either walk 3.3, or 3 miles, depending on which trail you took from the register.